This is an epic list of our top travel discoveries from 2015 including our favourite hotels, cities, meals, beaches, hostels and much more. This article is the best of our travel finds from this year and we hope that it inspires you, makes you smile, or makes you buy a guide book, plan a trip and book your flight! In 2015 we travelled to eight countries and a lot of cities, but choosing our top three cities of the year was an easy task because they were so phenomenal. There’s just something about this place! As soon as we landed in Havana, we felt recharged with a whole new travel energy. The architecture is beautifully restored in many parts, while crumbling with character in others, and the seaside promenade (The Malecón) is the perfect place to walk in the early evening, with classic cars whizzing past. We loved exploring the museums, art galleries, plazas, forts and back streets – the best way to spend the day. The pulsing energy of the city was amazing, the music was lively, and the dancing was contagious. The people we encountered were friendly and the nearby beach of Playa del Este was gorgeous! We were here for a week and wanted more. Most people consider Mexico to be a beach destination, and although it’s true that there are lovely beaches, this country has much more to offer travellers. The UNESCO listed, colonial city of Guanajuato is one such place. 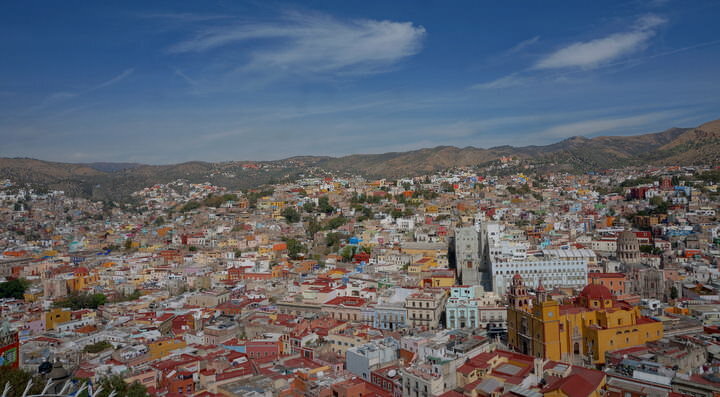 The colouful city of Guanajuato. Colourful homes and buildings tumble down the hillside before reaching the main streets, of which many are pedestrian-only. The narrow alleyways wind through neighbourhoods and almost always lead to a lively plaza. 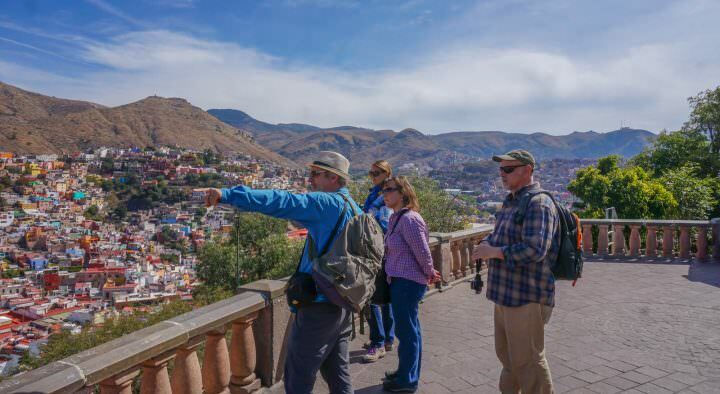 There are so many things to do in Guanajuato! We went on a food tour, saw the symphony, visited museums, wandered aimlessly, checked out churches, haggled at markets, and much more. We were there for 5 days, and could have done 5 weeks. New York is one of those iconic cities that everyone should see during their lifetime. And lucky for us, we were able to experience it this year. We had one day in Manhattan to explore the sights, feel the hustle and wander through the many exciting neighbourhoods. Our time in the city was cut short, as we were heading upstate for a press trip with Mashable and Cathay Pacific, but we loved Manhattan! New friends in upstate New York. This 3.2 km stretch of golden sand and clear water is one of the best we’ve ever seen. We love how the water here is usually calm, and that there are some great beach bars lining the sand. The views of the mountains and the colourful capital of St. George’s are icing on the cake. The lovely Grand Anse Beach. 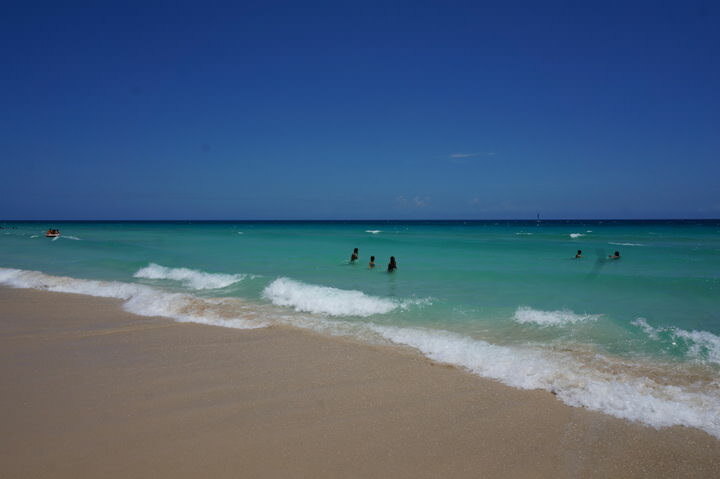 Located just a 20 minute bus ride outside of the capital of Havana, this 9 km stretch of white sand is not to be missed. We spent the day here playing in the Atlantic waves, and eating cheap peso food! This is a popular spot for locals, and makes for a great day-trip from Havana. This is the ultimate day trip from Havana. Some of the beaches in this area aren’t great for swimming as the waves are large, and the undercurrent can be strong. But, Carrizalillo Beach is safe for swimmers and it is absolutely gorgeous! After descending down 155 + steps, you’ll arrive at this lovely Pacific coast cove. The sunsets here are sublime, the water is refreshing and there are a handful of beach shacks serving up snack food. 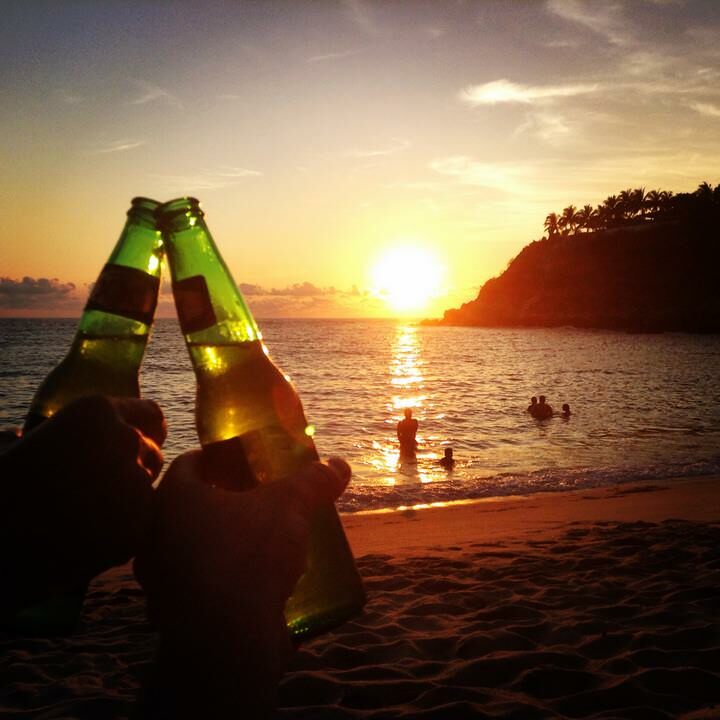 We went here every day during our stay in Puerto Escondido and we would love to return one day. Runner-up: Carlisle Bay in Barbados is a close tie for 3rd! The water is impossibly clear and the sand is powdery white. The entire bay is gorgeous. I don’t know how we ever travelled without this little gadget, and I know we’ve mentioned it a lot, but it’s the hack that we love! Suddenly, after plugging in the extender, we both have a more solid, stable and reliable wi-fi signal. It’s perfect for hotels, hostels and cafes. When searching online for the perfect flight, most people browse around for a while before coming back to book a little later on. The booking engines know that you’ve already been to their flight booking page before, and that you’re interested in that specific flight. 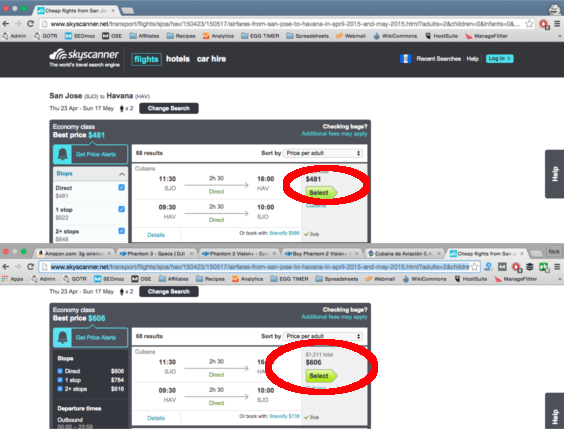 Magically (yet somehow legally), the flight cost will be higher than the first time you looked. Before booking, clear your cache, or go “incognito” (command+shift+N on Mac, or control+shift+N on PC), and you’ll be pleasantly surprised to find that (more often than not) the price of your flight will be the same as the first time you checked. This happened to us, with our flight from Costa Rica to Cuba going up $125 per ticket! Luckily, we booked incognito and saved ourselves $250. 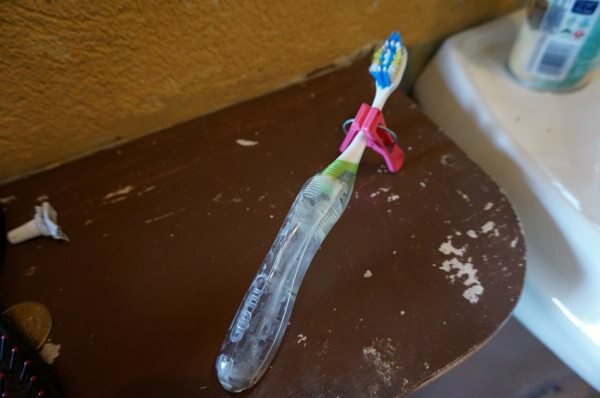 You know when you’re staying at a hotel, or sharing a bathroom in a hostel and you need to put your toothbrush down on the counter? Well, imagine just how disgusting that countertop is – who knows when it was last cleaned?! Bring a clothes pin with you and use it to prop up your toothbrush. Much more sanitary this way! Clothes pins can also seal holes in mosquito nets and tightly close those curtains so your neighbours can’t peek in! There are some fantastic travel bloggers out there, and we’re so grateful to be a part of a supportive and inspiring blogging community. We read and follow many blogs, and honestly this list could go on forever. We’ve been following Simon and Erin for a couple of years now and love how they have a similar travel / lifestyle mentality as we do. 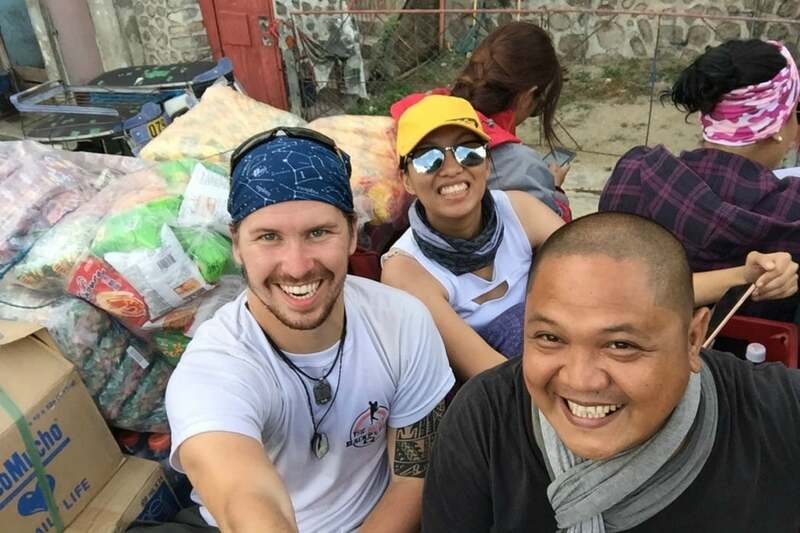 Like us, they are digital nomads who live and work on the road, full-time. 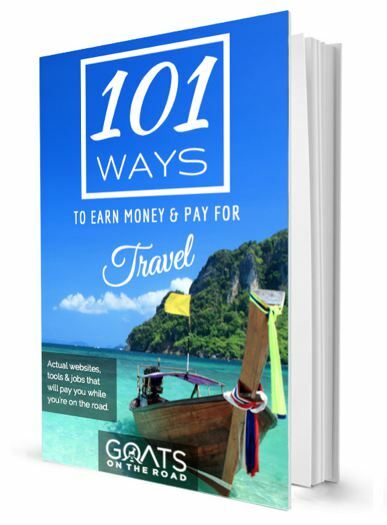 We appreciate how in-depth their articles are, and how they explain in detail the costs of living in various destinations. 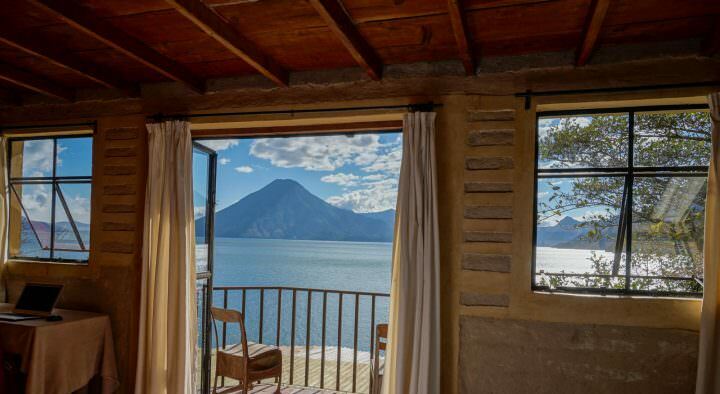 Their information on living on Lake Atitlan was very useful for us when we were trying to rent an apartment on the lake. Plus, they’ve created an awesome travel budget app which we downloaded this year – the Trail Wallet. Good work guys! 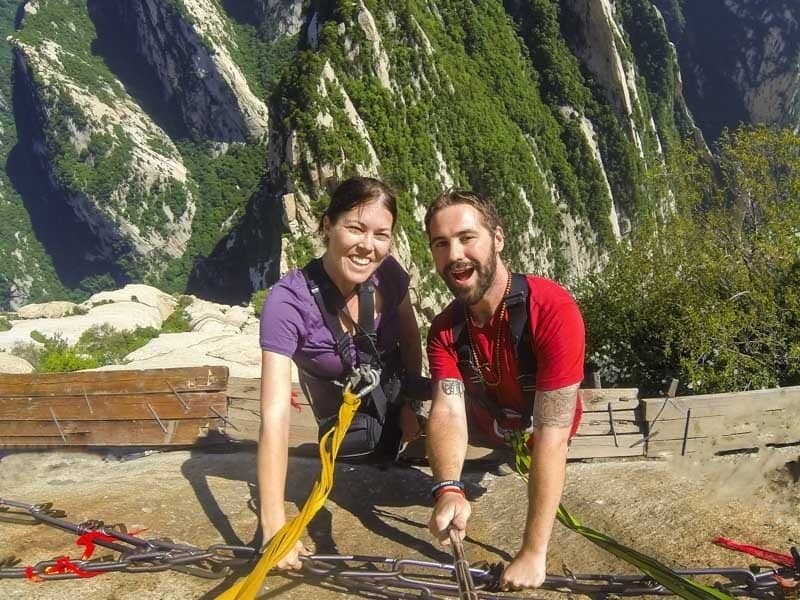 Antonio and Amanda definitely are adventure junkies! They’re cycling around the Americas…that’s right, by bicycle, not motorcycle, and are currently in Patagonia. I first became interested in their story when we were in Grenada because they had travelled & cycled through the Caribbean on a budget. The more I learned about them, the more intrigued I became. They’re dive instructors and travel bloggers, who (like us) have a desire for freedom, travel and adventure. Check them out and get inspired! 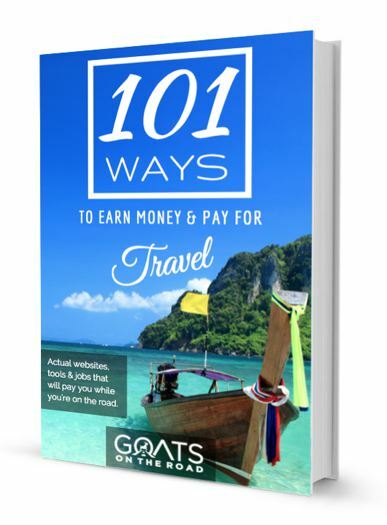 Jarryd’s writing skills are top drawer and he’s been featured on BBC Travel, Yahoo and more. Alesha is the photographer of the two and is extremely talented. On top of all of this, they’re just really great people and we’re hoping to meet up with them in person this year. Will is the man behind the Broke Backpacker travel blog. He’s a solo backpacker on a mission to travel from the UK to Papua New Guinea by land. Again, another crazy adventurer who doesn’t want to take any flights. He prefers to get under the skin of a country, rather than just skimming its surface. He opts for couch surfing where possible, hitch-hiking, getting off-track, and doing as the locals do. He’s recently written an ebook on travel blogging, has been featured on many large publications and is an all around cool guy. A shout-out to some other bloggers whom we very much admire: Expert Vagabond, Just One Way Ticket, My Tan Feet, and The Planet D.
Located in an awesome spot, away from the busy town, but close enough to walk to restaurants and the best beach in the area. This hostel has a swimming pool, basic breakfast included, an outdoor communal kitchen, hammocks, daily room cleaning, friendly staff and good wi-fi. Double rooms are 600 pesos ($35), with discounts for longer stays. The pool here was awesome! In Cuba, the casa particulares are where most budget travellers stay (or those looking for a more authentic stay). 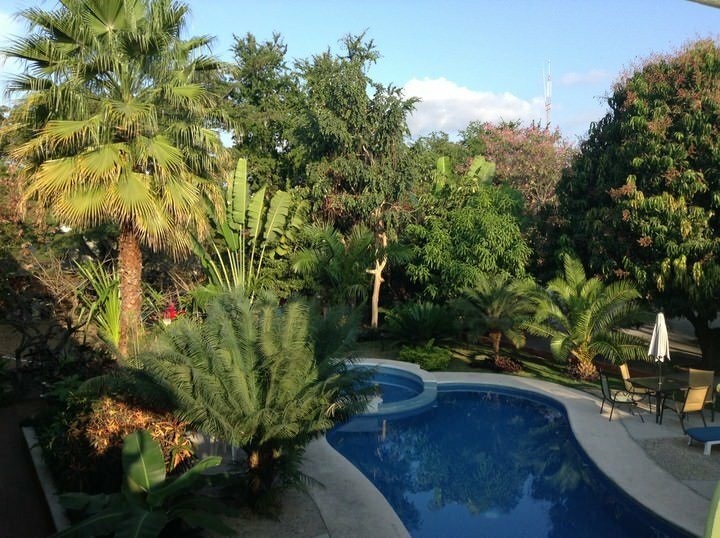 This casa has 5 meter high ceilings, beautiful decor, and is owned by a friendly and extremely hospitable family. Our room was spacious and clean, with a private bathroom and air-conditioning. The food here was really good too! We especially loved that it was located in Central Havana, which was a more “local” area of the city. Rooms were $7.50 / person. 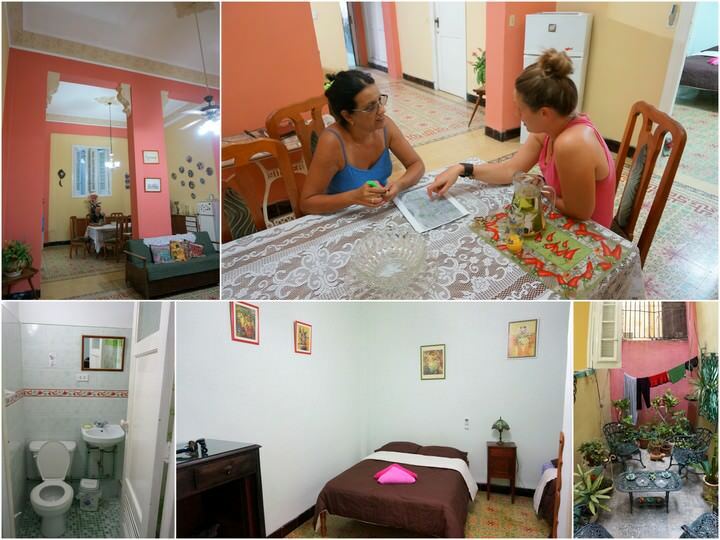 Casa Daniel y Fina is a great choice in Havana. Another vote for Mexico’s hostels! The rooms here are large with a private bathroom. There’s a communal kitchen, small breakfast is included, there’s a pool table, wi-fi and a bonfire for chilly nights. There are discounts for long stays, those travelling by motorbike, and anyone who checks in on their birthday. We love the Phantom 3 drone that we picked up earlier this year. Nick has always been passionate about video creation and editing, and the drone is the perfect addition to his arsenal! I’m the co-pilot, spotter and launch-pad (I launch and catch the drone in my hands). We think that this piece of kit has really improved our YouTube videos and gives a unique prospective on each destination we visit. Being able to create videos that aren’t shaky and don’t make our viewers sick to their stomachs is definitely a good thing! The Go-Pro camera attaches to the G4 3-axis, motorized gimbal. This is a must-have for stabilization. Think of an electric, image stabilizing, selfie pole that perfects a smooth cinematic experience. When travelling and living in various countries, we sometimes like to watch TV shows and movies. It’s uncomfortable to watch shows on our laptop all of the time, but luckily, we don’t have to do that anymore. 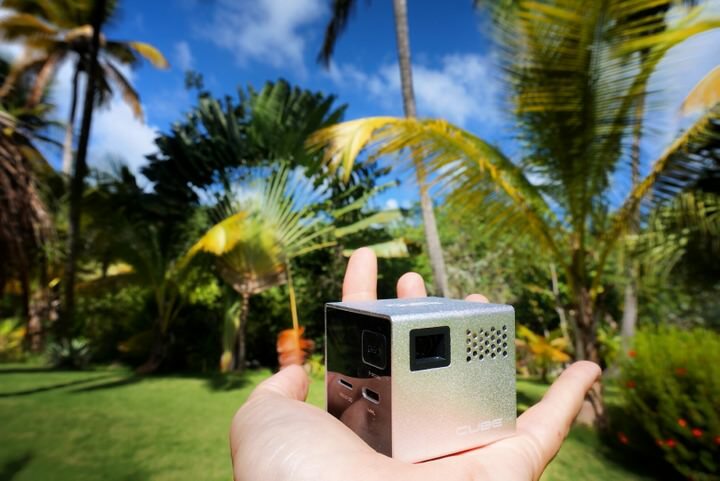 The Cube is a mini, 2 inch x 2 inch projector. You just plug in your smart phone, device or laptop to the Cube and it’ll project out onto a wall / screen up to 100 inches wide. Movie nights on the road have never looked so good. This little gem is located in the perfect area of Puerto Vallarta, just steps from the Church Of Our Lady Guadalupe, a couple of blocks from the ocean side promenade, and minutes from the Old Town. The rooms are colourful, clean and very affordable (around $50 / night). The little courtyard area covered in vines and the unique Mexican art which adorns the hallways is a nice touch. 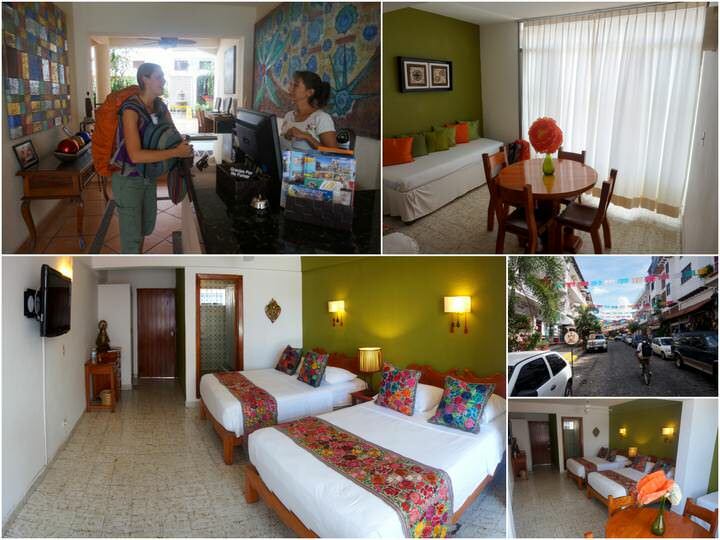 We loved our stay at the Hotel Catedral in PV! 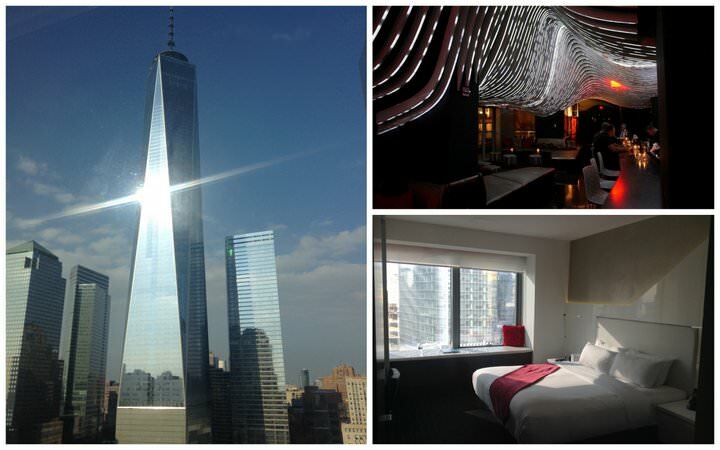 The W Hotel has 5 locations in New York City. We stayed downtown and loved it there! This hotel was chic, fun and had a youthful vibe. There’s actually a lounge in the hotel as well with live music and a bar. The staff working here were friendly and attentive, and our “Spectacular” room was gorgeous! We had an unobstructed view of the Freedom Tower. This is the hotel to stay at during a trip to NYC. During our stay on Isla Mujeres, we had the pleasure of staying at this family run hotel for 5 nights. 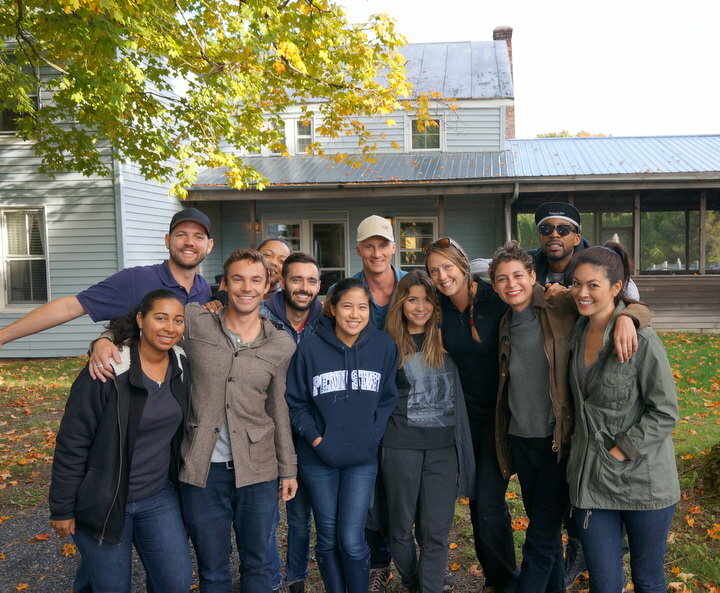 Run by a mother-daughter team, we felt like part of the family as soon as we arrived. The rooftop area has a small pool, a massive open-air kitchen for guests’ use, and hammocks for chillin’ out in. The rooms vary, but all of them are clean and comfortable. We highly recommend this hotel! 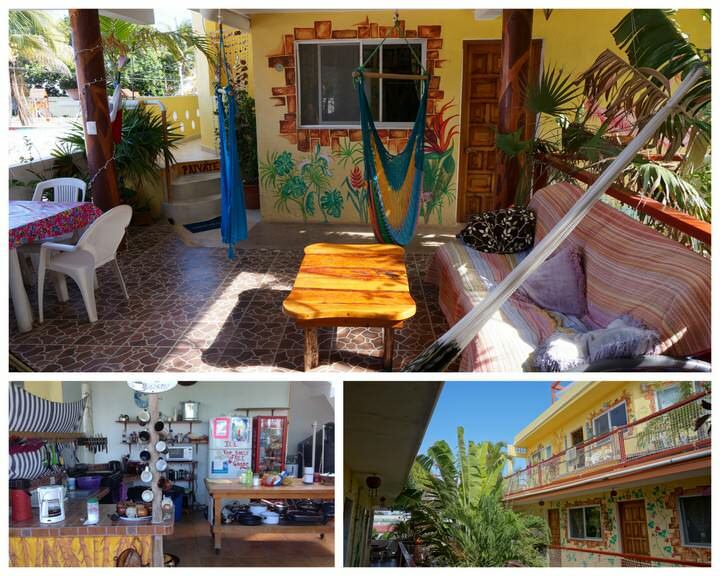 The funky, family run Las Palmas Hotel on Isla Mujeres. Food is one of the great joys of travel. 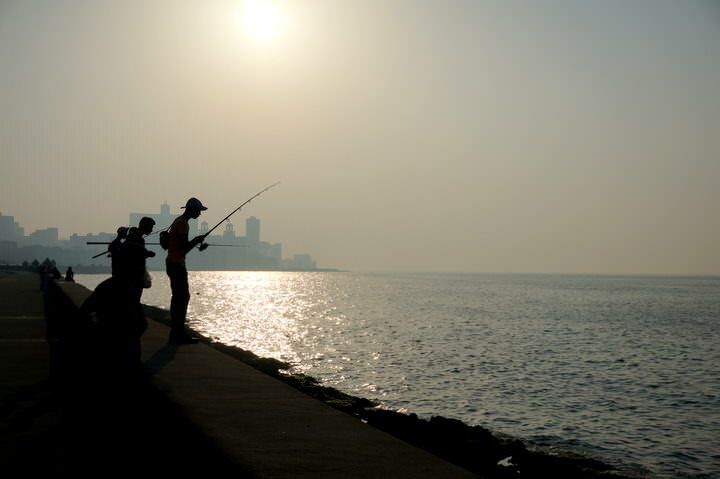 Oftentimes this is how you can truly connect with the locals, while learning about the cuisine of their country. Being invited into someone’s home is the ultimate gesture. At number one on our list of best meals is the oil down that we had at our friend Rolando’s, great aunt’s house! 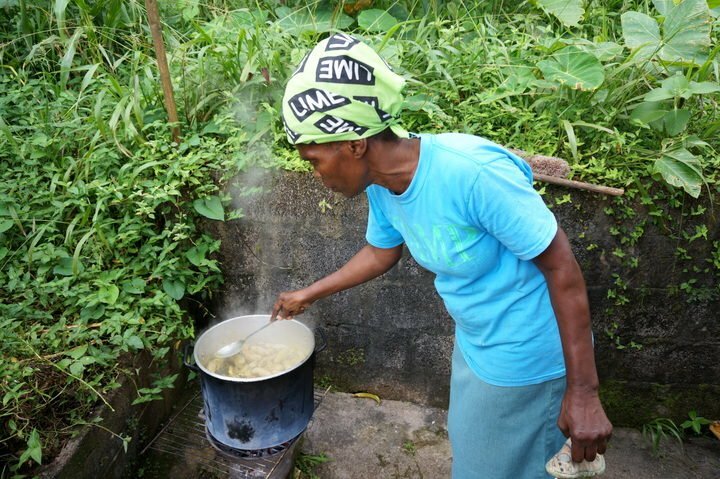 Tanty (a name Grenadians give to their great aunts) showed us each and every step in making Grenada’s national dish and we enjoyed spending the day liming with her and our friends. Breadfruit, crab, dumplings, callaloo, pigtail and conch are some of the many ingredients in this spectacularly flavourful, one-pot meal. Every Friday night in the fishing village of Oistins, there is a fish fry party. Not only is the party and atmosphere a lot of fun, but the food on offer is delicious! Freshly caught, grilled fish of your choice (I recommend the mahi-mahi) is served with macaroni pie, salad, rice n’ peas and potatoes. The meal is huge and remarkably flavourful. 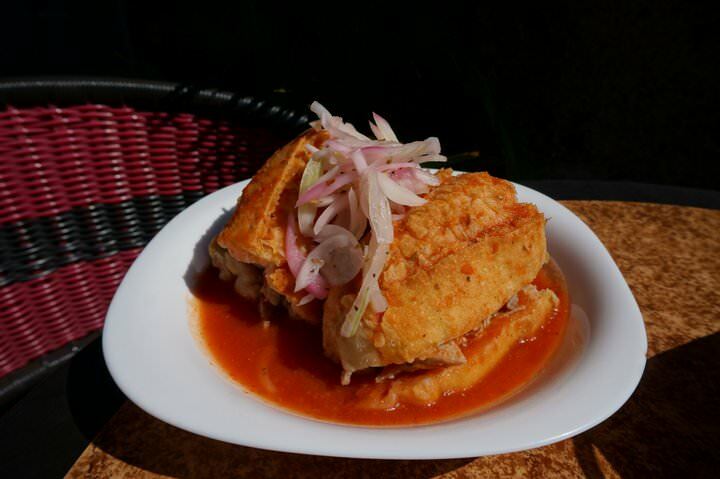 This “drowned sandwich” is traditionally found in the Jalisco state, and in particular, the city of Guadalajara. We went searching for this sandwich and were impressed with what we found. Bread (which is crusty on the outside, but soft on the inside), is partially submerged in a spicy tomato sauce, then sliced in half and stuffed with fried pork and grilled onions. Apparently, this is the hangover cure. I’m not sure if that’s true, but all I know is that it’s cheap and delicious! Every year there are certain moments in our travels that stand out for one reason or another. This year was no exception. Carnival is a well-known festival in the Caribbean, especially in Brazil and Trinidad. Last year, in Grenada, we attended the parade with the colourful, provocative costumes, and this year we went to the J’ouvert party…which starts around 4:30 am, and goes until 11:30 am. We followed floats down the street, while “wining” and dancing to the blaring soca music. 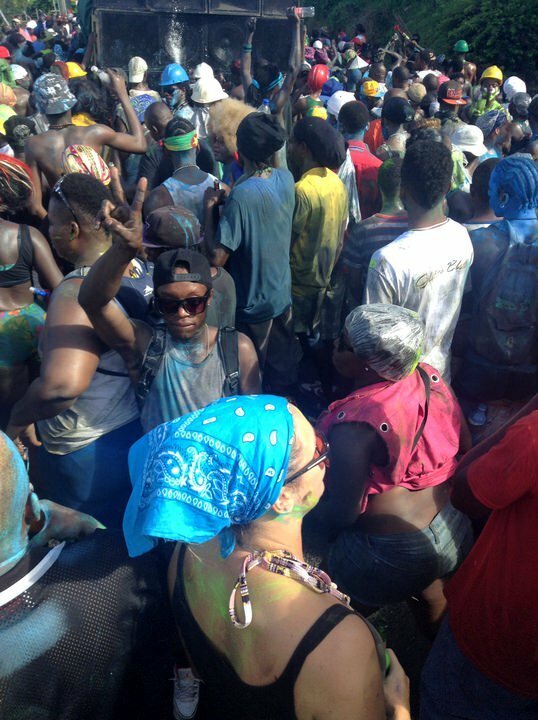 We were covered in paint from the “jab-jabs” and had a blast with our Grenadian friends. 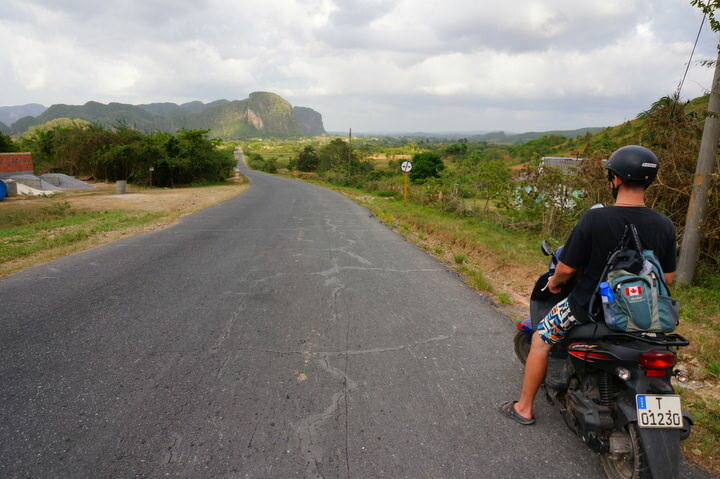 The entire experience in the countryside town of Viñales was exceptional. We hiked on foot through farmland, visited tobacco plantations and went caving. However, the moment that stood out the most was one of the days when we rented a scooter and drove ourselves about 2 hours outside of the town. We sped through villages, stopped when we felt like it, and arrived at the stunning beach of Cayo Jutias, where we spent the day. Having our own wheels was the best way to see the area. Being able to explore Cuba by motorbike was so fun! Our casa outside of Santa Cruz was the perfect place for us. We loved our little home, the views of the volcano and travelling around by boat. Our neighbours / landlords were great and often offered to take us wakeboarding with them! Hiking into town, watching sunset and exploring nearby villages made for an excellent 1.5 months. 1. How Much Will Southeast Asia Cost? Definitely no complaints with this outdoor office! Follow our YouTube Channel to see a weekly travel video from destinations around the world. This has been an epic year to say the least! We hope that 2016 is even more exciting for us and everyone who reads this blog. Happy holidays to all and thanks for reading! Love this! Since I’m so new to the blog, this is a great way for me to catch up 🙂 We’re just looking back at our 2015 too and can’t wait to share. Nice list, there’s so much in it. The WiFi range extender hack blew my mind, though. How did I not think before of travelling with one of those?? I knew they existed, but I’d never tried one. Next trip I will, for sure. We just learned about them this year, and I spent 2 years losing my mind with my Acer computer – which hardly ever had a signal, while Nick was happily typing away on his MacBook! Get it, it’s awesome. Great post! It seems you guys had a fantastic year and I hope 2016 is as fun-filled as 2015 for everyone 🙂 Your blog is a lot of help to me as I’m planning a (short) trip to Cuba for February! I hope I love it as much as you guys seem to do! Thanks for commenting Dominique 🙂 I hope you like Cuba! Happy travel and all the best in 2016. Thanks for the feature, some great picks you have listed here! We also got the Gimbal this year and no words can express how much we love it. Next thing we’re getting is a drone after playing with it a bit! Happy travels and hope you’ll make it to Asia next year, it seems we gonna be here for a while. Would be great to catch up for a beer! Cheers from Chiang Mai! You’re welcome for the shout-out, much deserved, we love your website 🙂 Isn’t the Gimbal pricelss? I don’t know how we created videos before it – so shaky! 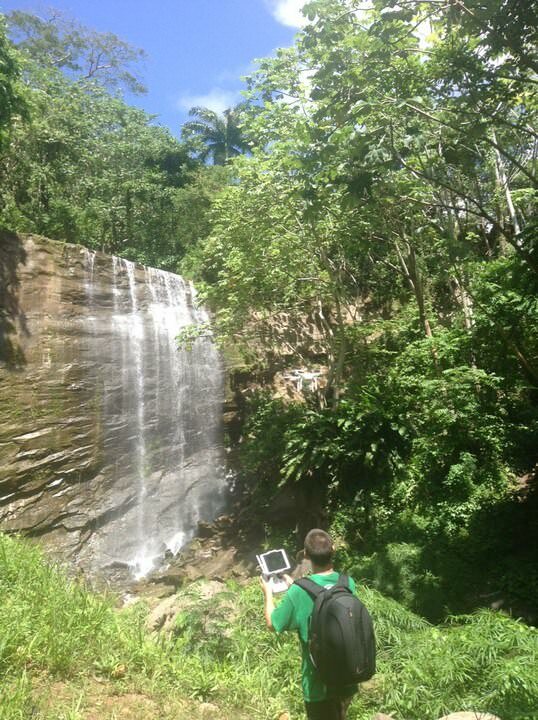 We love having the drone too, so fun to use! Next year we do have Asia in our sights, so hopefully we can meet up with you, finally! What a great round up of the year! Thanks for including us guys! 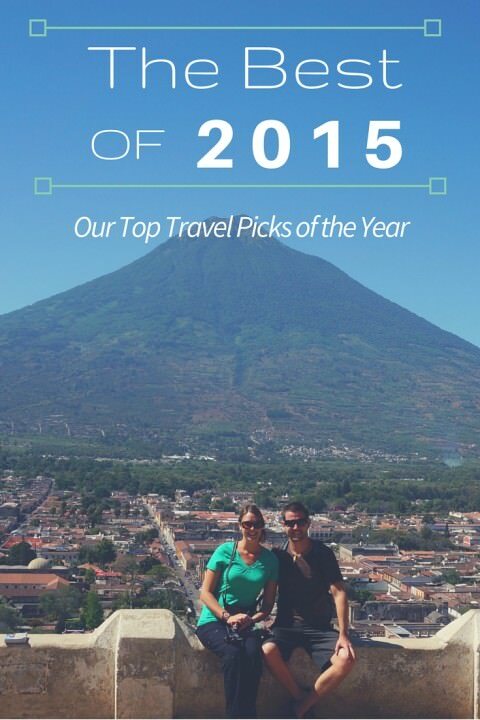 I’m glad you enjoyed Cuba, Guanajuato and Lake Atitlan as much as we did. Cheers and all the best in the new year. What a year spent on the road … hope your 2016 is even better! Yes this is an excellent summary of your year and I found a video that I’d missed. Merry Christmas. Sounds like you had an amazing year! A highlight for me this year was travelling to Cape Town and spending some time in the winelands i(Franschhoek). It was wonderful! Absolutely a fabulous year! Thanks for hi-lighting your fave’s!